Sierra Vista and Schurr (California) were named co-champions of the Mountain Lion/Blazer Classic after rain forced the cancellation of Tuesday’s championship game at Sierra Vista. 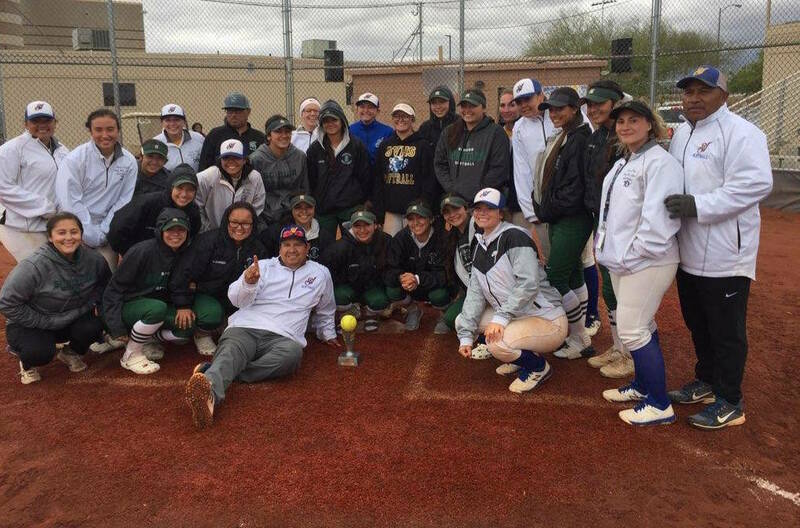 Members of the Sierra Vista and Schurr (California) softball teams pose for a group photo after the championship game of the Mountain Lion/Blazer Classic was rained out on Tuesday, April 16, 2019. Photo courtesy of Raul Almaguer. The Mountain Lions rallied past Desert Oasis in one semifinal Tuesday. Schurr held off Rancho in the other semifinal. The consolation final between Marshall (California) and Durango also was washed out. Sierra Vista 9, Desert Oasis 8 — At Sierra Vista, Ryan Watkins’ single with two outs in the bottom of the fifth plated Taylor Edwards and Tyerra Kaaialii with the go-ahead runs as the Mountain Lions edged the Diamondbacks in six innings in a semifinal. Desert Oasis scored once in the top of the sixth and had the potential tying run on first when Kaaialii struck out the final batter of the game. Watkins was 3-for-4 with a home run and four RBIs, Taylore Edwards and Alexis Ridley each added two hits for Sierra Vista. Jaid Raval was 2-for-4 with two RBIs, and Holly Severance was 2-for-3 with a triple, a double and an RBI for Desert Oasis. Schurr (Calif.) 6, Rancho 5 — At Sierra Vista, Aniz Roman was 2-for-3 with a triple and two RBIs, and the Spartans scored twice under international tiebreaker rules in the top of the seventh inning to nip the Rams. MacKenzie Perry was 2-for-3 with a double and an RBI for Rancho. Liliana Gutierrez was 2-for-3 with three runs, and Sierra Crane was 2-for-4 with three RBIs for the Rams. Desert Oasis 11, Rancho 7 — At Sierra Vista, Makayla Rickard’s inside-the-park grand slam highlighted a seven-run first inning that propelled the Diamondbacks by the Rams in five innings in the third-place game. Rickard was 2-for-4 with six RBIs, and Amber Brocoff was 2-for-3 with three RBIs for Desert Oasis. Raval went 3-for-3, and Paisley Garcia was 3-for-4 for the Diamondbacks. Gutierrez was 2-for-2 with a triple and an RBI, and Taya Friedrich was 2-for-2 with a double for Rancho. Perry was 2-for-3 with two RBIs, and Kaitlyn Suarez was 2-for-4 with two RBIs for the Rams. Green Valley 14, Legacy 8 — At Durango, Olivia McClain went 3-for-4 with a double and three RBIs to help the Gators storm back to top the Longhorns in four innings. Abigail Cordova was 2-for-2 with a triple, a double and three RBIs for Green Valley, which scored 11 runs in the bottom of the fourth inning. Kaleah Alapati was 2-for-3 with two doubles, and Kiani Tung went 2-for-2 with a double and an RBI for Legacy. Marshall (Calif.) 12, Green Valley 5 — At Durango, Viviana Guzman went 3-for-4 with a home run, a double and two RBIs to lead the Barrister past the Gators in six innings. Cindy Martinez-Escamilla was 3-for-3 with an RBI, and McClain went 2-for-2 with a solo homer for Green Valley. Marshall (Calif.) 9, Silverado 8 — At Durango, Jazmin Frias was 3-for-4 with two home runs and six RBIs to lead the Barristers by the Skyhawks. Jocelyn Maly was 3-for-4 with a double and two RBIs, and Olivia Johnson was 2-for-3 with a double and two RBIs for Silverado, which got home runs from Jessica Boothe and Alezandria Guarigilia.